Coconut milk is a nutritious, tasty and super food for babies and kids, its believed as a next best thing to breast milk. Coconut milk is a liquid extracted by grinding the coconut meat and straining it. The process of making coconut milk is too simple except the grating part. The miracle liquid has creamy texture and natural sweetness which makes it perfect for babies. Read more on how and when to introduce coconut milk to babies and health benefits of it. Coconut milk can be introduced to babies diet from 8 months. Giving plain coconut milk to babies is not a good idea, hence add few table spoons of coconut milk to mashed vegetables or any porridge to enhance the taste and creaminess. Please keep in mind that for babies below one year, breast milk or formula should be major and it should not be replaced with coconut milk. 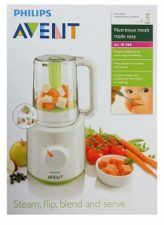 For Toddlers and kids, you can add it to milkshakes, smoothies, soups, rice or curry. You can give maximum 1/2 cup of coconut milk per day. Dont give more amount than mentioned as it keeps the tummy full for long time and hence the child can not eat other foods. 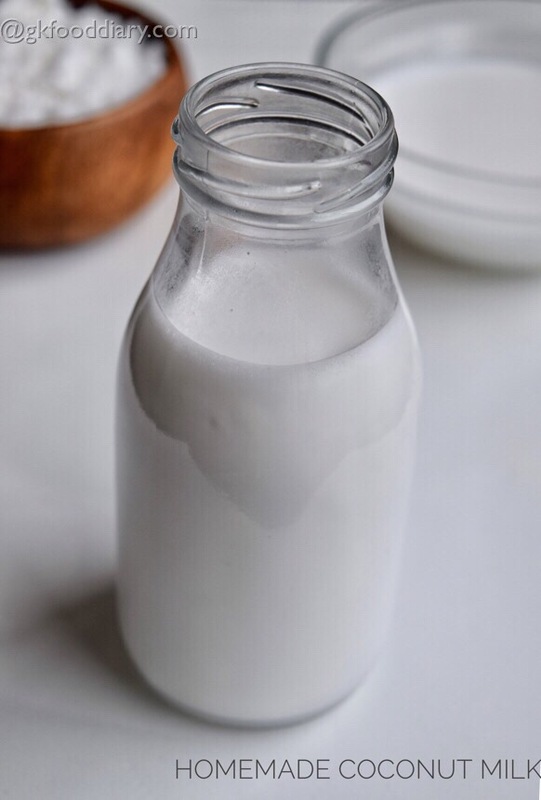 Also note that coconut milk cannot be used as a complete substitute for cows milk for toddlers and growing kids as its low in calcium and protein. One cup of coconut milk contains 25% 0f daily iron which prevents anemia in children. Lets get on to check how to make coconut milk at home for babies, toddlers and kids. Cut and open the coconut. Transfer the coconut water into a separate bowl. Now start grating the coconut using a grater. 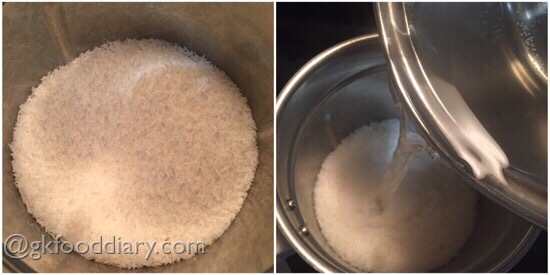 Measure and collect 2 cups of grated coconut. Transfer the grated coconut to a blender/mixer. Add in 4 cups of warm water. 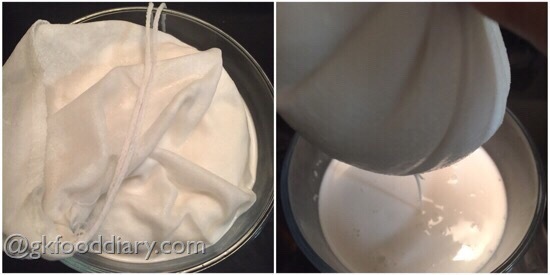 Transfer the ground coconut mixture to a cheese cloth/muslin cloth/ nut milk bag/white cloth/strainer over a wide bowl. I used nut milk bag. Squeeze out as much coconut milk as possible. If using a strainer, press it with a spoon to collect the milk. 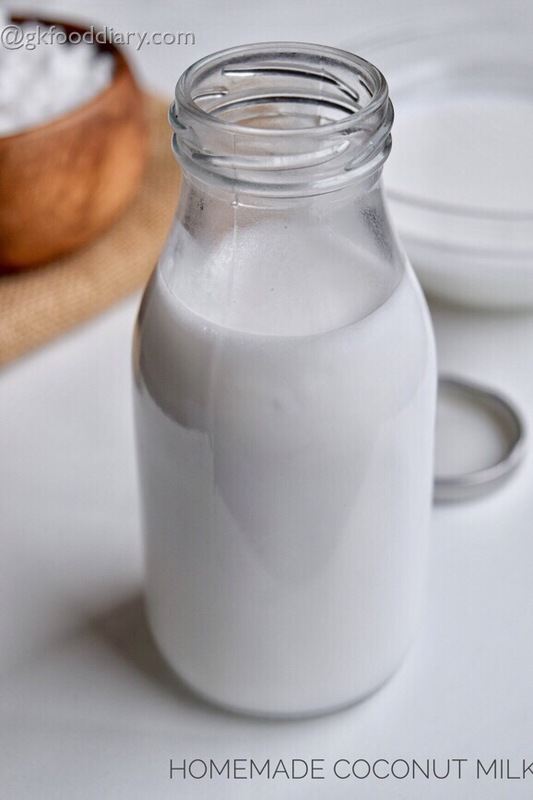 The extracted milk is a thick coconut milk (also known as first coconut milk). Transfer to a airtight container. You can use it immediately or refrigerate as per your preference. It stays good for 2-4 days in refrigerator. 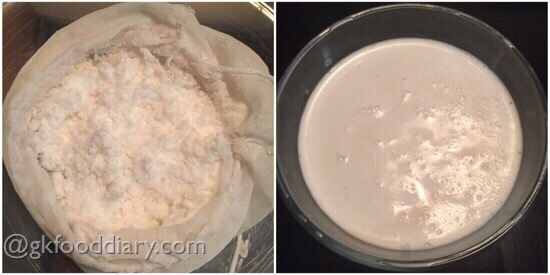 You can discard the leftover coconut pulp in the nut bag or you can make a thin coconut milk (second coconut milk) from it by adding 1 cup of warm water, blend and then strain to get the thin coconut milk. 1. Cut and open the coconut. Transfer the coconut water into a separate bowl. Now start grating the coconut using a grater. Measure and collect 2 cups of grated coconut. Transfer the grated coconut to a blender/mixer. Add in 4 cups of warm water. 2. Grind it to a smooth paste. 3. 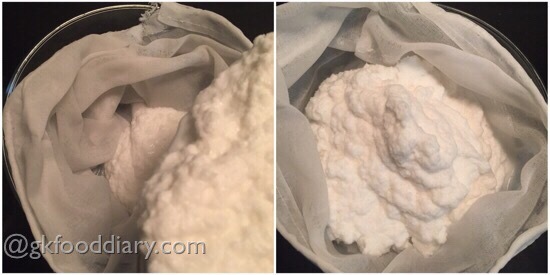 Transfer the ground coconut mixture to a cheese cloth/muslin cloth/ nut milk bag/white cloth/strainer over a wide bowl. I used nut milk bag. 4. Squeeze out as much coconut milk as possible. If using a strainer, press it with a spoon to collect the milk. 5. 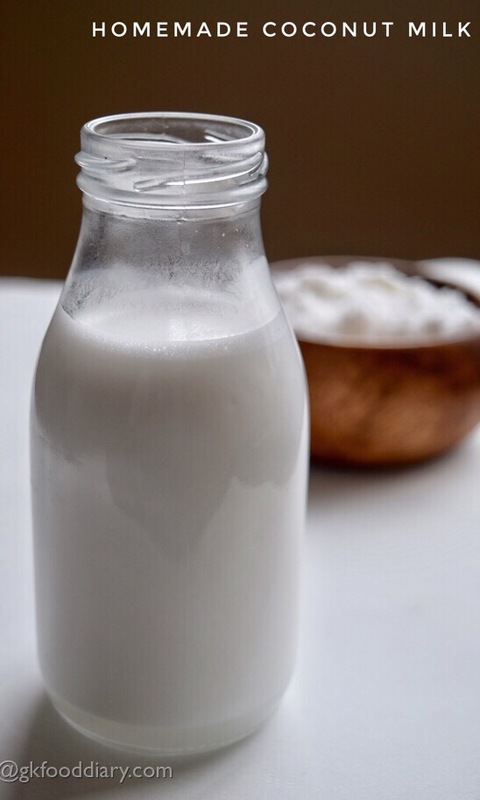 The extracted milk is a thick coconut milk (also known as first coconut milk). Transfer to a airtight container. You can use it immediately or refrigerate as per your preference. It stays good for 2-4 days in refrigerator. 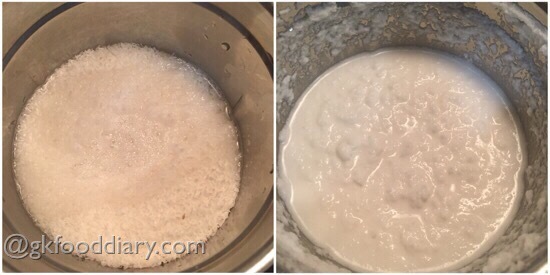 You can discard the leftover coconut pulp in the nut bag or you can make a thin coconut milk (second coconut milk) from it by adding 1 cup of warm water, blend and then strain to get the thin coconut milk. Fresh homemade coconut milk is ready! Fresh coconut yields more milk. You can use it immediately or refrigerate as per your preference. For babies and small kids, prefer freshly extracted coconut milk. It stays good for 4 days in refrigerator. 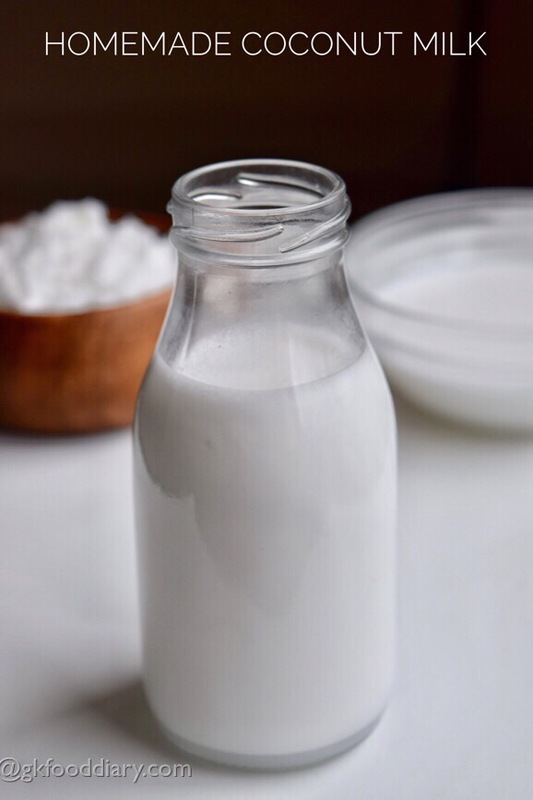 You can discard the leftover coconut pulp in the nut bag or you can make a thin coconut milk (second coconut milk) from it by adding 1 cup of warm water, blend and then strain to get the thin coconut milk. Always remember that breast milk or formula should be major for babies until one year hence prefer the coconut milk occasionally in baby food. You can use fresh or frozen. But Fresh coconut yields more milk.